Make your 2015-Current BMW M3 unique with this "Power Dome" Highlight Graphic kit. This easy-to-install Single (1) piece kit is PRECUT and ready to install in a wide variety of colors - NO TRIMMING required! This stripe package is not just a universal set of stripes in a box. 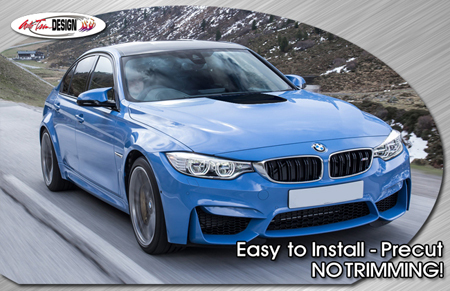 Our graphic kit consists of prefit and contoured piece(s) that are specifically made for the 2015-Current BMW M3 and will not fit any other vehicle. Graphic is made to go 5/16"(7.93 mm) past hood edge and wrap under for a more finished appearance. If the lip under the hood edge is not cleaned thoroughly, the vinyl may not adhere properly.